Thank goodness for Quentin Tarantino. Without him, I would have considerably fewer epic moviegoing memories. My first time seeing this week’s film The Hateful Eight (DVD/Download) was during the “Roadshow” screenings. This included a delightful color program, an opening overture composed by Ennio Morricone, and midway through- a much needed bathroom break (the one time in my life the line for the men’s room was longer than the women’s). Why can’t every movie experience be so civilized? The Hateful Eight is an interesting Western because most of the action takes place in only one room. Set in a stagecoach stop-over in Wyoming during a blizzard, the “Eight” are various lawmen, bounty hunters, criminals, and Civil War generals all trapped together. A mystery unfolds slowly (who poisoned the coffee???) as we hear more about the characters’ backstories, and realize that not everyone is who he appears to be. As usual, we have a strong Tarantino female played by Jennifer Jason Leigh, and many cast members from previous QT films. Props to Kurt Russell for acting around his Yosemite Sam mustache, and Samuel L. Jackson really gives it his all as the blood-drenched FOAB (Friend of Abraham Lincoln). For a 3 hour film, with very little action and A LOT of dialogue, Tarantino has managed to make a hilarious movie that manages to keep me on my toes as an audience member. No easy feat. As previously mentioned, the big mystery the inhabitants of Minnie’s Haberdashery are trying to solve is who tampered with the coffee. How appropriate then, to have a hot, caffeine-filled drink to enjoy while you watch the action unfold. 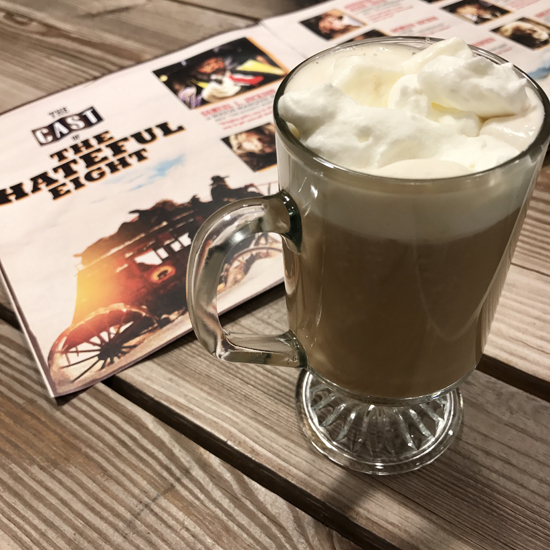 When viewing The Hateful Eight, I recommend drinking a Poisoned Coffee. Combine coffee, bourbon, cream, and maple syrup in a heat-proof glass and stir gently to combine. Top with whipped cream, if desired. Although Westerns are definitely not my preferred genre, when Quentin Tarantino makes a movie I know I’ll watch it and love it. Good writing is good writing whether it’s set in the seedy underbelly of LA or a snowy cabin in Wyoming. Sure there’s blood and gore aplenty, but always in the most humorous way possible. It may look like a western, but as we all know- looks can be deceiving. Cheers! Posted in Action/Adventure/Heist, Dramas and tagged Hateful Eight, Jennifer Jason Leigh, Kurt Russell, modern western film, movie cocktails, Poisoned Coffee, Quentin Tarantino, Samuel L. Jackson, westerns. Bookmark the permalink.